Well, it is official, Christmas has arrived. Although there are a few benefits to it having arrived 2 weeks ago. 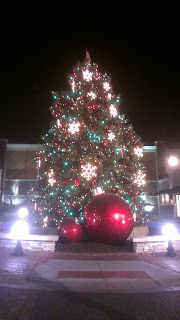 One of them is that the local shopping malls put up the decorations and we get t enjoy them. In this case the beautiful tree is accompanied by two big balls.